Hello there! I have a layout on the Scrapbook Circle blog on the subject "Be Real". This was a great challenge for me, because I mostly scrapbook emotions instead of memories. Since I scrapbook as a form of art and not as a way of recording memories, I tend to create my layouts based on emotions "love, happiness, etc". For today's layout, I was challenged to create a page based on a picture of something that happens often in my life--like taking my pup for a walk. I had taken a few photos and posted it to my Instagram, which in turn inspired this page. 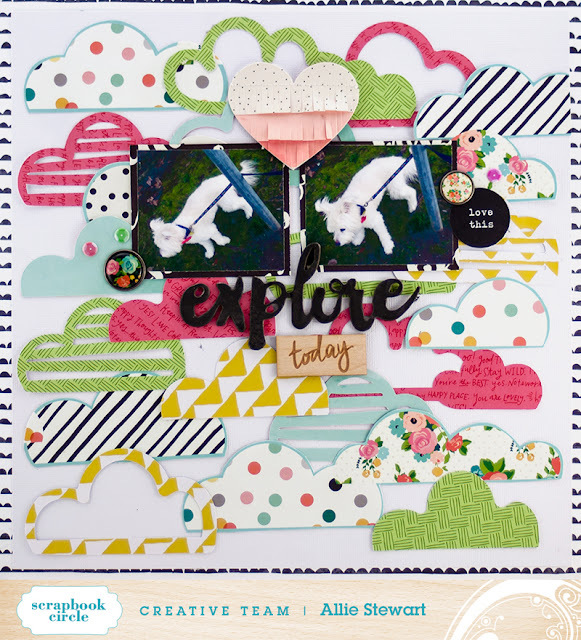 To create this layout, I fussy cut the cloud shapes out from the Simple Stories Carpe Diem Fist Bump paper included in the April One Fine Day Kit. I cut The Cut Shoppe Happy Clouds cut file from the Dear Lizzy Happy Place 6x6 paper pad in the Stay Cool Add-On. 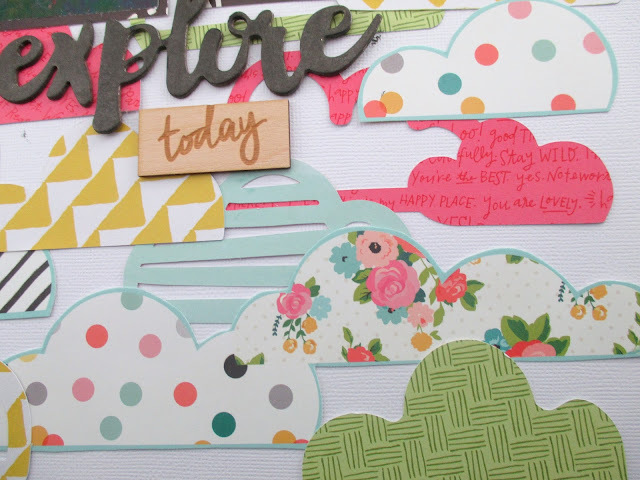 Next, I layered and arranged the clouds until I was happy with the placement, then adhered them to the page. Once I had my clouds glued down, I added my photos and title. I was happy that the green in the patterned papers matched the grass in the photo so well! I used black mist to paint the white chipboard title. I kept the rest of the layout pretty simple in order to focus on the fun clouds. This was a great challenge for me because it pushed me outside of my subject comfort zone, AND I ended up using multiple photos! I hope this layout inspired you today, thanks for stopping by!